Just after the Event Horizon Telescope project announced last week that its astronomers had managed to capture the first-ever image of a black hole, MIT tweeted this image. Katie Bouman is a postdoctoral fellow at Harvard who helped develop the code to find the black hole needle in the haystack of data collected from the effort. This photo shows the first time she saw the results of that work, with the black hole image on her computer screen. This is a photo of a pure "Eureka!" Moment. It's delightful, an inspiration. 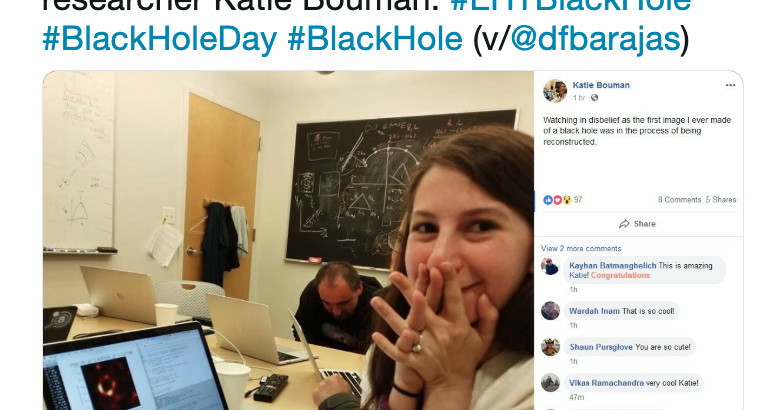 It quickly went viral, and news outlets including the New York Times began hailing Bouman as the "face of the black hole project." But then all the attention became a catalyst for an incredibly sexist backlash on social media and YouTube. It set off "what can only be described as a sexist scavenger hunt," as The Verge described it, in which an apparently small group of vociferous men were questioning Bouman's role in the project. "People began going over her work to see how much she'd really contributed to the project that skyrocketed her to unasked-for fame." 1; and we would not even be talking about it if platforms like Twitter, Reddit, and YouTube did not allow trollish thinking to fester and spread virally. But there are a few key lessons to take away. One is that while the "lone genius" narrative can be incredibly tantalizing, it's almost never true, especially in science. Another is that women often do not feel welcome in scientific fields – and the reaction to Bouman's picture reveals hostility many women scientists face all the time. Lastly, to combat this hostility, we need to see more images of women thriving in science. In telling stories about science, there's a bias in our culture to focus on the lone genius. It's how the history of science is often told: The world exists one way, and then people such as Issac Newton, Albert Einstein, Thomas Edison, and the like come along and shake up our fundamental understanding of things. Sure, sometimes the "lone genius" trope is warranted. But, especially in present times, science is hardly ever a solitary endeavor. The biggest recent discoveries in physics – of the Higgs boson, of gravitational waves, of this black hole image – still involve a huge number of people working over the span of decades. And there were many, many more tweets riffing on the assumption that Bouman was the driving force behind the discovery . Bouman and her colleagues clarified, in no uncertain terms, that the black hole image was, most definitely, a team effort. In all, more than 200 scientists worked on it – from all over the world. Heck, even the shipping manager tasked with making sure hard drives made it to the scientists safely from observatories all around the world, including Antarctica, played a crucial role. "No one algorithm or person made this image," Bouman wrote on Facebook. "It required the amazing talent of a team of scientists from around the globe and years of hard work to develop the instrument, data processing, imaging methods, and analysis techniques that were necessary to pull off this seemingly impossible feat. It has been truly an honor, and I am so lucky to have the opportunity to work with you all. " In fact, collaboration was crucial to the Event Horizon Telescope's study design. There were several teams tasked with generating algorithms, independently of one another. The goal was to see if all the results were all in agreement with one another, so that the Event Horizon could feel confident publishing them. The "lone genius" trope is usually unfairly bestowed upon men. And not just by the media but by prestigious scientific institutions. Think of the 2017 Nobel Prize for physics: It was given to Kip Thorne, Rainer Weiss, and Barry Barish for the first-ever detection of gravitational waves. Just three men were awarded the prize, despite the fact that thousands of scientists – men and women – worked on the discovery. Throughout history, women's roles in major scientific discoveries have been unfairly downplayed or overlooked. Consider Rosalind Franklin's contributions to the discovery of the structure of DNA. Or the story of Katherine Johnson – the black NASA mathematician whose story became the basis for Hidden Figures – whose work in calculating key orbital moves in the early days of manned spaceflight went uncelebrated for decades. The possibility that Bouman might have been a major player in the black hole discovery similarly seemed to have deeply upset right-wing trolls – perhaps because they feel their status threatened by women like her. "From their perspective, the elevation of Bouman represents little more than an example of an undeserving member of a group … given advantages she has not earned, "Kteily says. Bouman's picture may have been overhyped – again, she was just one of many brilliant people working in collaboration. But it's still important. We see so few images of triumphant women in science. "When you think about what a scientist means, you probably think of an Einstein figure – a man in a lab or a chalkboard with fuzzy, unkempt hair," my colleague Julia Belluz once wrote. "When you think of a scientist's voice, you might conjure Neil deGrasse Tyson or Carl Sagan." That's because we do not see images of women scientists like the one above. "The association is reinforced in primary school science textbooks, where images of men outnumber images of women by 3 to 1," Belluz wrote. It can even be hard to find photos of women scientists – especially those from underrepresented demographic groups – on Wikipedia. When Canadian physicist Donna Strickland won the 2018 Nobel Prize, there was not even a Wikipedia published about her. A previous entry on her had been removed. She was not deemed significant enough. There are so many ways women scientists – and minority scientists – have been erased from history or not written into it. It's often hard to find photographs of historic female scientists (especially nonwhite female scientists), and many more Wikipedia pages of women scientists still need to be written. Images of women in science matter because far too many women are not encouraged to , or do not feel welcome to, pursue careers in science. To this day, many women feel a hostility when climbing the ladder of a career in science. Historically, science and engineering has been a white men's club. And it shows in the workforce to this day. 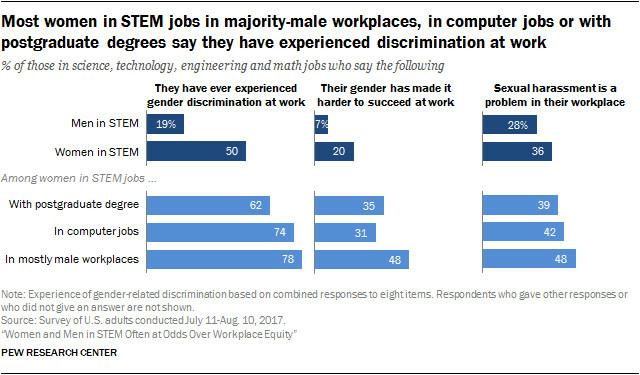 In January, the Pew Research Center published a report that found 50 percent of women working in STEM (science, technology, engineering, and math) have experienced gender discrimination on the job, and 36 percent say sexual harassment is a problem in their workplace. Women represent only 30 percent of the STEM workforce and see a significant pay gap compared with men's salaries. Women are often underrepresented at the top levels of academic hierarchies. And problems with discrimination appear to be worse when women work in male-dominated offices, according to Pew. Flagrant sexism still exists in science. Earlier this year, a CERN (European Organization for Nuclear Research) scientist made headlines when he declared at a scientific conference that "physics was invented and built by men, it's not by invitation." He was rebuked and CERN suspended him, but just the fact that he had the confidence to make such an assertion speaks volumes about the sexism in science lingering beneath the surfaces. And as hard as it can be for women, it's even harder for women of color. A 2015 survey found 40 percent of women of color working in astronomy "reported that they had felt unsafe in their current career position due to gender "in a survey. Twenty-seven percent of white women reported the same. "This represents a significant failure in the astronomical community to create safe working conditions for all scientists," the study authors wrote. "Significant proportions of women compared to men … reported that they had ever skipped a class, meeting, fieldwork, or other professional event because they did not feel safe." When you look at the right-wing reaction to Bouman's story – as exaggerated as some tweets about her might have been – it's no wonder why some feel this hostility. There are still too many people who do not want to see a woman in science succeed. Correction: This story originally stated Katie Bouman is a postdoctoral fellow at MIT. In fact, she's a post-doc at Harvard, and is soon to start as an assistant professor at Caltech.